Emerging markets have felt the backlash of investor sentiment amid the continuing trade spat between the United States and China, that escalated for months before a recent truce. However, Chetan Sehgal, senior managing director, director of portfolio management, Franklin Templeton Emerging Markets Equity, feels the response has been excessive and might pose opportunities for investors. In the first of this three-part series, “The Impact of US Policy on Emerging Markets,” Chetan explains why the United States’ influence over emerging markets could be fading. Arguably the biggest reason for the pullback in emerging-market equities has been due to the trade spat between the United States and China. But we think the market reaction has been excessive. While it’s certainly hard to predict how things could play out, in light of the recent G20 meeting and talks between US President Donald Trump and Chinese President Xi Jinping, there seems to be a sense there could be more negotiations and perhaps a more conciliatory tone going forward. In fact, rising US protectionism could act as a spur to some developing economies and encourage more regional trade agreements between emerging markets. We believe China has a pivotal role to play in that development. 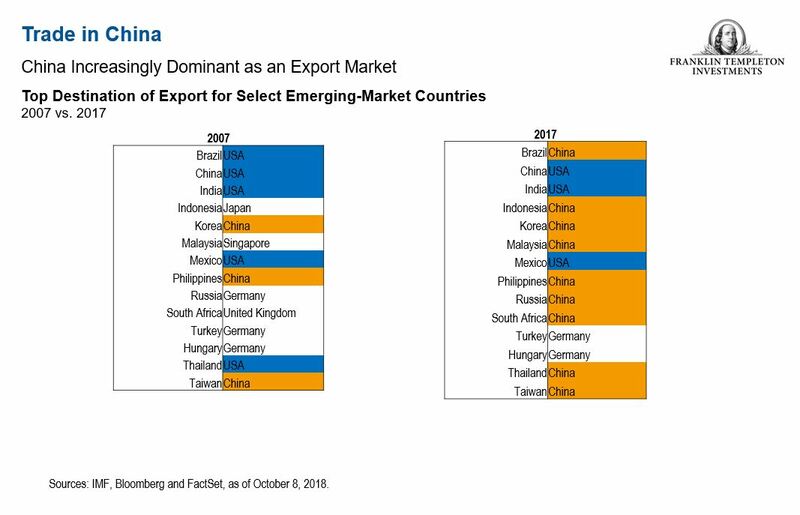 Over the course of the last decade, China has replaced the United States as the largest export destination for emerging markets as a whole. But the evolving trade relationship isn’t just one-way. China has usurped the United States as the top exporter to Brazil and Thailand. It has also replaced Japan as the top exporter to Indonesia. China’s economy has shifted to become more consumer-driven. We believe this shift can pave the way for other emerging-market economies to thrive and lead investors to gain more confidence in emerging markets. Demand for high-end items such as designer handbags and furniture, high-end cars and fine dining have soared, to such an extent that China now reinforces controls over personal imports of luxury items from returning Chinese citizens from overseas. China has become the world’s second-largest consumer market. The demand for goods and services among Chinese consumers continues to accelerate on the back of rising household incomes, creating opportunities for consumer-related businesses. 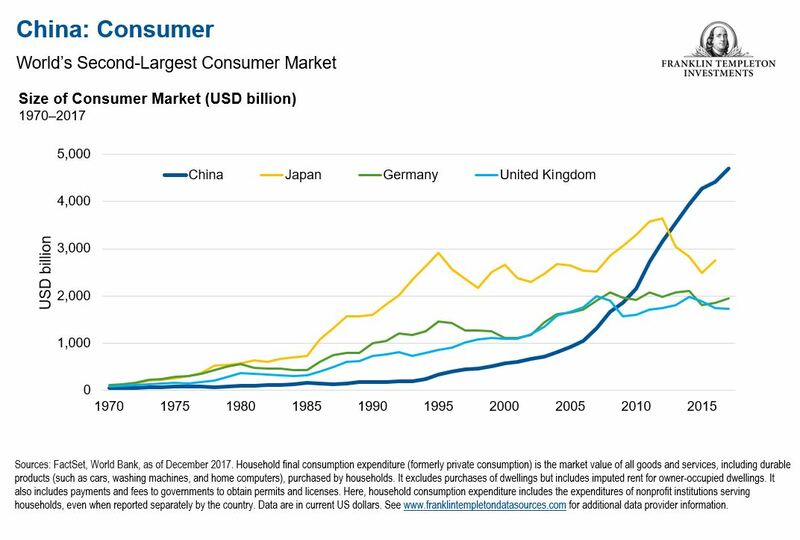 We believe consumption could be an increasingly important growth driver in China and other emerging-market economies. We are confident that the current environment could benefit the growth of technology manufacturing in emerging markets outside of China. In the last six years, China has slowly shifted away from manufacturing products for export. Policies unveiled at the 18th National Congress of the Communist Party of China in 2012 were designed to help steer the economy away from manufacturing into a consumption- and service-driven model. We think Vietnam and Malaysia could potentially benefit from this situation. Both countries already have transportation infrastructure in place, which in turn helps develop logistics and shipping networks to support regional or international trade. In comparison to China, Vietnam and Malaysia, which tend to have cheaper production costs and labor, could stand to take a bigger share of the manufacturing market. Major electronics companies already have a large presence in Malaysia and we’d expect exports of electronic integrated circuits, liquefied natural gas and communication apparatus to potentially increase. China has also taken a step away from manufacturing garments for export. Again, the United States’ imposition of tariffs on Chinese garments could create significant opportunities for lower-cost manufacturers like India and Vietnam. Garment production chains in these countries already include major international retail fashion brands. As the largest emerging market, how China fares amid a new era of trade and manufacturing could have profound implications for other emerging markets and for the global economy at large. The structural case for emerging markets still centers on further growth, demographics and the ability to take a larger market share of global manufacturing, which in our view makes up one of the elements that could allow other emerging-market economies to ride out and potentially thrive during this period. In our next post in this series on “The Impact of US Policy on Emerging Markets,” Chetan explains why the rising US dollar should have less impact on emerging markets than some might expect.